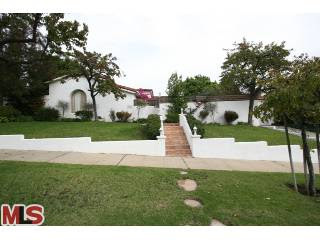 First is this Spanish home at 952 Malcolm Ave., LA CA 90024. Previously listed on 12/5/08 for $2,150,000, it spent 103 days on the market and was pulled off the market without any price reductions. At the time I did a post on 3 Little Holmby Fixers and an update to that post (Update To 3 Little Holmby Fixers), where 2 of the 3 ended up selling. I was surprised to not see 952 Malcolm sell at that time because it may have been the best lot to build on of the three. 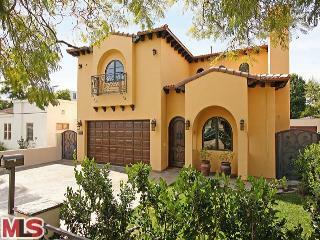 Now its been relisted for $2,250,000 and after only 11 days its now in escrow. I am a bit surprised by the higher price and quick listing period. But right now its the best flat pad option available at that price in Little Holmby. According to the MLS, the home is a 3 bedroom / 1.75 bath, 2,944 sq ft home on a 12,488 sq ft lot. There is no secret that this house is all about the lot. A huge flat pad to develop or expand on. The house itself is not that exciting as it currently stands. There is some curb appeal, but the layout and overall feel inside is just not up to par for the location. There are some traces of remodeling in the kitchen and master bath, but I believe the best use would be a major remodel and expansion or to start from scratch. The 2nd house to return to market after trying to sell in 2009 is the newer construction Mediterranean home at 2357 Kelton Ave., LA CA 90064. Kelton was previously listed on 11/14/08 for $2,450,000 and spent 365 days on the market with 5 small price changes, down to $2,195,000. 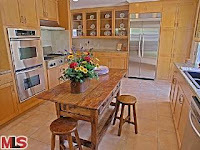 This home returned to market on 2/25/2010 with an asking price of $2,195,000. According to the MLS, the home is a 2008 built, 5 bedroom / 5.5 bath, on a 6,615 sq ft lot. In the previous MLS listing, the owner stated the square footage was aprox 4,400 sq ft of living space. 2372 Overland Avenue is back on the market with a new lower asking price of $759,000. Overland was previously listed on 3/25/09 for $899,000 and received one $100k price reduction during its 103 days on the market. The home was pulled off the market in favor of renting and continues to be rented until June 30th, '10. According to the MLS, the home is a 3 bedroom / 2 bath, 1,508 sq ft of living space on a 6,838 sq ft lot. If it wasn't for the location, this home would sell in the +/- $1M range. This is about a 25% location discount for being on Overland, near Pico. While this last house didn't attempt a sale in 2009, it did have previous attempts in '06 and '08. However, the owner leased the home out instead on both occasions. The most recent attempt in 2008 had the home priced at $1,635,000. 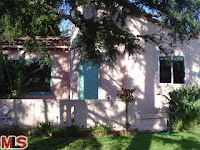 In its most recent bid to sell, 10583 Rochester Ave, LA CA 90024 was listed on 2/24/2010 for $1,399,000. According to the MLS, the home is a 3 bedroom / 2.5 bath, 1,860 sq ft of living space on 6,500 sq ft lot. The home has been remodeled throughout and features a large gourmet kitchen. The new asking price is $1,399,000.